"Jenny Wade House & Monument - Gettysburg - C 1935. " (1841) POSTCARD: Jenny Wade House & Monument - Gettysburg - C 1935. -Condition: Good +.- Not Posted. 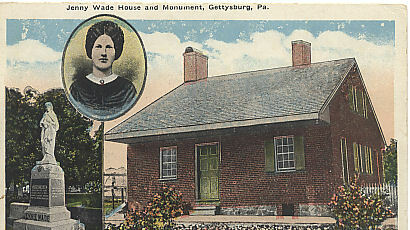 Colored pictures of home, monument and insert of picture of Jenny Wade. Description on back says she was the only citizen of Gettysburg who was killed during the battle. Interesting note: there was a spelling error in the description. It added a small "e" to the beginning of Gettysburg (eGettysburg). Price: $3.50 + shipping.